In my last blog I wrote about starting a new journey with Fleygur, without Roger. It was an easy thing to write after all I knew pretty quickly that I could not stand the thought of parting with Roger’s horse, but the emotional reality this week was hard, really hard. I struggled to cope with the necessary financial forms that had to be completed notifying the various authorities of my ‘change in circumstances’, and my emotional exhaustion made it hard to motivate myself to do anything, even to ride. I meant to, every day I said ‘today I will ride’ but I didn’t. Still the horses provided me with comfort as I knew they would and just visiting with them, spending some quality time and thinking about the new journey I am on with them all helped to keep me going and focus on the positives. I remain overwhelmed by the responses I have had to Roger’s death (those are still the hardest two words to write) both from those who knew us and those who knew of us through this blog. I have had many messages of support and comfort and again I thank you for these. I want to assure everyone who has contacted me that I am receiving a huge amount of support from family, friends, neighbours and work colleagues, both practical and emotional. My loss has sharpened my need to write and I have chosen in this blog to focus on my journey with the horses and their part in my coming to terms with my loss, because this blog is essentially about the horses and our passion, Roger’s and mine for the Icelandic horse and my intention to share our learning and experiences with others. I know there are many facets of grief that I will have to deal with but they will not all feature here. 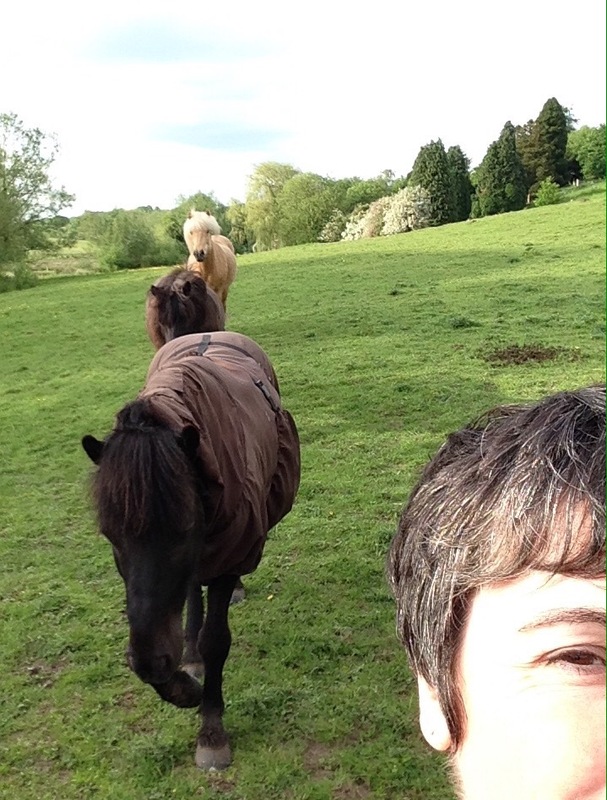 I felt I needed to say this, to reassure those who have expressed concern for me and to be clear that the Little Viking Horse blog will remain essentially about the horses and what we can learn from them. I say ‘our passion’ and ‘our learning’ still because in addition to my memories of our many conversations about our horses I have Roger’s note books where he recorded his thoughts and ideas as he sought to become a better horseman. So with all that said I will return to the lessons I learned from the horses this week. I did not ride all week, but I did spend time with the horses. Gydja is on painkillers daily for her arthritis and so daily I needed to bring her in for a feed. I have long been able to lead Gydja with no halter just cupping my hand under her chin but now that she has discovered that there is a feed at the the end of our stroll together I do not need my hand either. At first Jandi and Svipur would try to get ahead of Gydja or block us at the gate to try to secure the food for themselves, but I was firm with them making them back up away from me and now just a gesture is needed, mostly, to check them and keep them in line. It very satisfying see them all trooping behind Gydja and I now they have learned their proper place! Repetition and consistency, especially consistency will be important in my being able to handle four horses at liberty in the field. Icelandic’s are known for being ‘biddable’ on the ground and generally having good manners but these still have to be taught and maintained. It is very easy to create a pushy nippy horse and I have had to curb my natural inclination to give treats all the time for this reason. I also thought about developing my relationship with Fleygur, of course he is the same horse but we need a new relationship. He is the most intelligent of our horses, learning very quickly but he is also the most anxious and was closely bonded with Roger quietly watching his every move and I did not know how all this was effecting him. So I decided that each time I went to the field I would greet Fleygur first and say goodbye to him last, usually with a scratch on his favourite itchy spot. Over just a few days he was more visibly acknowledging me when I entered the field and I was getting more direct eye contact, though one day I did catch him looking over my shoulder directly at the front door of our house – perhaps looking for Roger, who would have usually arrived after me? At the weekend I attended a clinic that Roger and I had booked onto some weeks ago, my first time away from home since losing Roger. Friends kindly collected two of the horses for me and rather than camp as Roger and I would have done I was invited to stay in the house. These things made it possible for me to go though I won’t pretend it was easy. I cried as I packed, cried when the horses marched up to meet me when I arrived, cried before I got on Fleygur for the first lesson that would have been Rogers, and cried some other times too. I missed Roger hugely, and on Saturday lunch time missing that I could not share with him what I had learned that morning I took some time on my own and cried some more as it dawned on me ‘Oh my god, this is forever’. Feeling the need to hear Roger’s voice I read through some of his musings about the challenges Fleygur presented in his note book and thought back over my lesson. 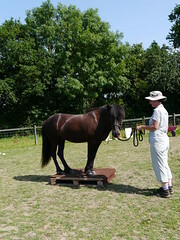 It had started well, Fleygur is a forward going horse, very forward, and over the last year Roger had worked on improving his walk, getting him to stretch forward and down and walk in a more relaxed fashion. Karen, the trainer commented on how improved his was but then as I asked him to walk on a smaller circle he just stopped and wouldn’t move forward. I turned him and we tried again. He stopped. I backed him up and tried again and again he stopped. Was he testing me? I was more assertive and as I became more insistent with my signals to walk on he became more agitated, but he wouldn’t go forward. This was completely unlike Fleygur something was wrong. 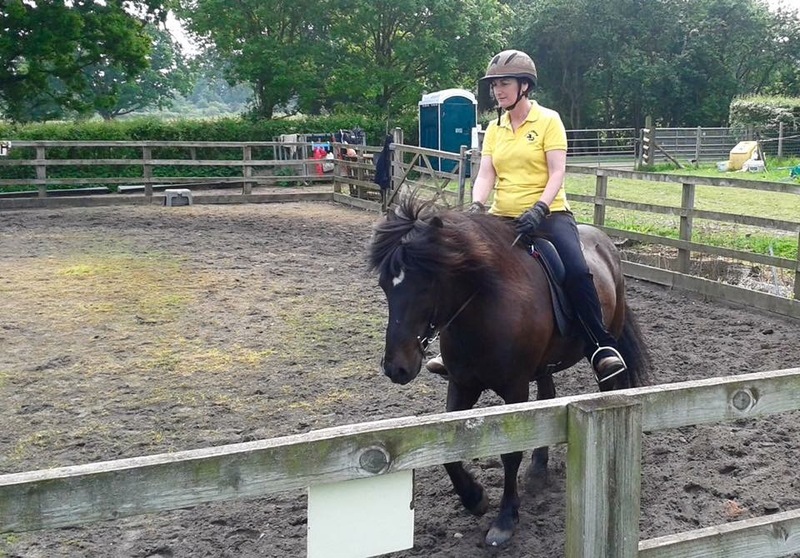 I was riding in my own saddle, a treeless Solutions saddle, could it be that? We took the saddle off, checked everything we could think of popped it back on and I tried again. He stopped. As I explored the problem with the trainer we realised part of the problem. 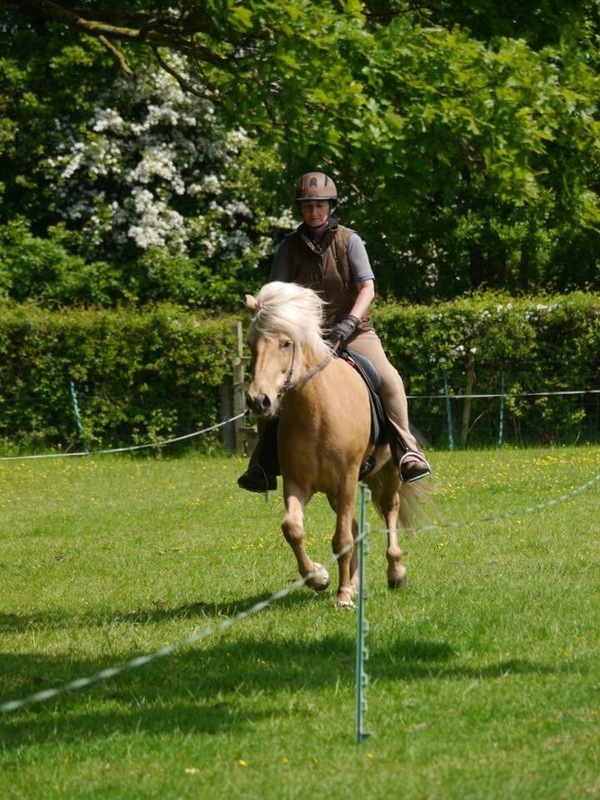 Same horse, but different relationship, different rider…. different signals! Out on on hack it didn’t matter, he was secure and knew the job well enough that some blurry signals didn’t get in the way but in the school out of his comfort zone, and mine, the accuracy of my cues became more important. I had been giving him mixed messages, my voice and my rein aide and the tilt of my body said ‘walk on’ but my seat said ‘stop’ and if in doubt Fleygur stopped. Not a bad default position. The problem was my tension possibly combined with the saddle I was riding him in where I could feel his back muscles and he could feel every bit of the tension in my seat. Roger had taught Fleygur an excellent stop using his seat alone, sometimes backed up with a voice command. If Fleygur did not stop on the button he was asked to back up six steps and the exercise was repeated. Instead of being more insistent I breathed out and consciously relaxed my seat and asked for the walk on again, bingo! For the afternoon lesson I swapped back to Roger’s saddle, a Trapezius (flexible panel) saddle, and concentrated on staying relaxed. This produced much better results but equally it was clear to me that forming a new relationship with Fleygur as my riding horse and building his confidence in me was going to take time. The next day Fleygur was offered the opportunity of some downtime, as I rode Svipur in the lessons, but instead he choose to protest being left in the paddock on his and and charged around the place shouting and working up a bit of a sweat even though Svipur and I were in plain view all the time. I was pleased with Svipur’s performance and received positive feedback on my riding and our progress since the last clinic last year. It was a tough decision to attend this clinic on my own but I am glad I did. I was surrounded by people who knew Roger and we talked about him often over the weekend. 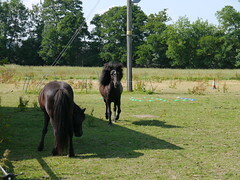 It was a supportive place to be and kept me connected with the community of Icelandic horse owners in the UK where Roger and I made many new and good friends. 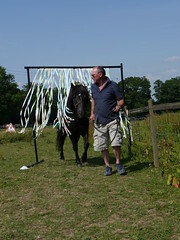 Today we celebrate Roger’s life and bid him farewell and the horses will be part of this too. In writing this blog I have asked for nothing in return I just wanted to share our passion and experiences with our horses that others may enjoy and learn from them with us. In response to Roger’s untimely and sudden death I have received many messages from around the world and know that our stories, Roger’s, mine and the horses have reached many people, and some have asked if there is anything they can do. Well done! The first steps are the hardest!